Tonight Abstract Puzzle got a slight refresh, removing some expired App Store links, as well as adding headers for “Forthcoming” games Puzzle Prison and ActionGo, and “Retired” games ActionChess and Oppo-Citrus that were removed from the app store last September. I also added Root Down to the lineup, and changed some wording here and there. Sadly, For The Win will be moving from “Mobile Board Games” to “Retired” sometime in the next month or so. I got the same email from Apple about it as I got for the other two games. I don’t have time to update it to support all the new screen sizes (and that app in particular would probably require some new graphics). I gave a very similar (but slightly different and less long-winded) talk at Minnebar 2017 to the one I gave a few months ago at Cocoaheads. Probably the only notable difference is the inclusion of a screenshot from my new Unity port of ActionGo, for which I made this 30 second trailer. Additionally, I was contacted today by a student looking for more information about my experiences in the local game industry. If you are interested in that sort of thing, I’ve posted the transcript below. I presented this short talk at a MN VR & HCI meetup last night. Last week, as part of their initiative to clean up the app store, Apple marked two of my oldest apps as needing updates or they’ll be removed from the store (in 30 days). Since I don’t really have time to update them right now, I’m changed their pricing to free so everyone has a chance to download them before they’re removed. When I do get around to doing updates, I’ll definitely put them back back in the store as paid, so get ’em while they’re free! The affected games were ActionChess and Oppo-Citrus. These are games that I’m really proud to have made, so if you haven’t played ’em, please do go check them out. (And let me know what you think!) Enjoy! Anyway, I felt I should write something here. I’m still going to keep this project going through the end of the year, and I want to write a recap of the entire year at some point, summarizing the number of entries, frequency of certain types, and generally just doing some meta-creative analysis. 7/8 – I thought a bit about an augmented reality game in VR. So there is a virtual environment, and you put on a “headset” in the game, that then changes some aspect of the environment (either how it looks, or by changing it). 7/9 – Missed a day. 7/10 – A game where you are a walking flower, with littler flowers for eyes, and you collect flower petals to open doors that looks like giant flowers. 7/11 – A hat collecting puzzle game. A game where you put hats on cute furry animals. A game where hats are currency. A game with hats on top of hats on top of hats. A game where hats indicate status and occupation and stealing a person’s hat is tantamount to stealing their identity. A game with hats as achievement badges. A game with hats for guns. A game with hats to indicate belts in a hat-based kung-fu with hat-katas and hat-hand to hat-hand combat. Hattastrophie. 7/12 – A game inspired by some conversations on slack about Pokémon Go and “skinner box game mechanics”, labeled simply, Skinner Box: The Game. A game that attempts to recreate a Skinner box like experience as closely as possible. You are a rat in a cage. You have a single button and you are being conditioned to press it. 7/13 – Some thoughts on the milieu/setting/premise for a game set on the construction site for a giant city-sized building. The thing has been “under construction” for hundreds of years and the entire process has been meant to be self-sustaining from the beginning, so you have folks whose job it is to make food for the folks whose job it is to make concrete, etc. 7/14 – A game inspired by packing a moving truck full of boxes. Essentially you have a bunch of different boxes and you have to fit them into a truck. I was imagining this as a VR game, because I think it’s more fun if you have the 3D perspective on it. You could have a bunch of different sized trucks and scenarios. Maybe it starts out just packing trunks of cars getting ready to go on vacation. 7/1 – A sort of turret game where you control the angle, thrust, and explosion intensity of fireworks. Your goal is to line the trails up with stars in the sky above. Maybe this is in VR and you have to also line up your gaze at the right angle too. 7/2 – Had the revelation that it might be worth prototyping the playground games I’ve worked on in the Vive. My original journal entry for the playground games were written back in November 2014, so I’ve been thinking about these for a long time. This idea could use another entry (or two), since there are at least a few different games that could be evaluated whether they would “work” in the Vive, and how. 7/3 – A game you play with keys and locks. Maybe this is a match-2 game. The twist is that there is only one match on the board for each other tile. So it’s actually a lot like the match trivia games I made for Moai, with a sort of fantasy skin. Maybe there are also chests or safes, and any lock next to it is assumed to go with it. Once all the locks are open, the save opens and gives you a powerup, or maybe just another key that you need to proceed. 7/4 – You know how you can play “giant monopoly” at a bunch of different board game conventions? A lot of publishers have giant versions of their board games, and you can even buy some of them commercially. (Giant Jenga and giant connect-four are both playable at the recently opened Up Down arcade in Minneapolis). Anyway, this idea is basically just that you could play those giant versions in VR without having to have enough space for them. I was looking at my shelf of board games when I had this idea, and in particular imagining the game Spiel, (which is a pyramid of dice), and how fun it would be to walk around that game, and throw giant dice around. 7/5 – A VR relaxation/exercise game called Sway. The main game input mechanic is the name of the game. You progress “forward” by moving your weight from foot to foot, swaying back and forth. The game will also prompt you to look left right, up down, for neck stretches, and to swing your arms or spiral them, essentially doing upper body stretches. 7/6 – As you can see to the right, I spent a bit of time this week (a few hours so far) prototyping a game from this entry. Some friends and fellow MN gamedevs recently conceived and built The Donutron, and I was basically lamenting the fact that there aren’t (yet) any games made for it specifically involving donuts. 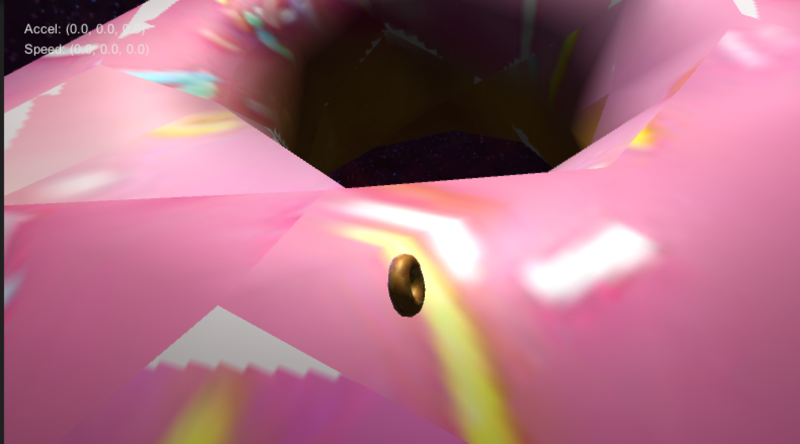 So this idea is just that you are a donut, rolling around a giant donut, collecting donuts. I’m soliciting feedback on a name for the game. 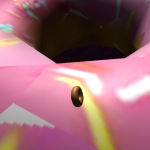 Here are the possible names so far: Donutworld, The Little Donut, Space-Time Donut, It Came Frosting Space!, Planet Donut, Donut Moon, Space Case Donut Race, TorusTime, DonutFall, DonutGame, Donutroid, Donut Donut Donut!, Donut on Donut (on Donut? ), Donut Eat Donut, Yo Donut, I heard you like Donuts!, Donut Moon. I’m leaning toward Donut on Donut, or Donut Eat Donut. 7/7 – A few different one-line game ideas yesterday: An open world board game (open in terms of you can do anything at any time). Game where your body is melting as the timer mechanic. Game where your feet are rats and you can’t really control where they go without cheese. Game where the world is a bicycle tire. Game where you are made of lava and melt / burn everything you touch. Game where you head is a book and you have to fill it with words.